"Don't open the door! Don't cross the line!" An official UK trailer has debuted for the indie horror thriller titled A Dark Song, from Irish/Welsh filmmaker Liam Gavin. The horror story follows a determined young woman grieving over the loss of her young son, who reaches out to an occultist with experience in an ancient invocation ritual that she believes might allow her to make contact with her deceased child. Catherine Walker stars as Sophia, with a cast including Mark Huberman, Susan Loughnane and Steve Oram. This played at Fantastic Fest and the London Film Festival, and looks like a very creepy thriller. Take a look. A determined young woman (Catherine Walker) and a damaged occultist risk their lives and souls to perform a dangerous ritual that threatens to blur the boundaries between this world, and the next. 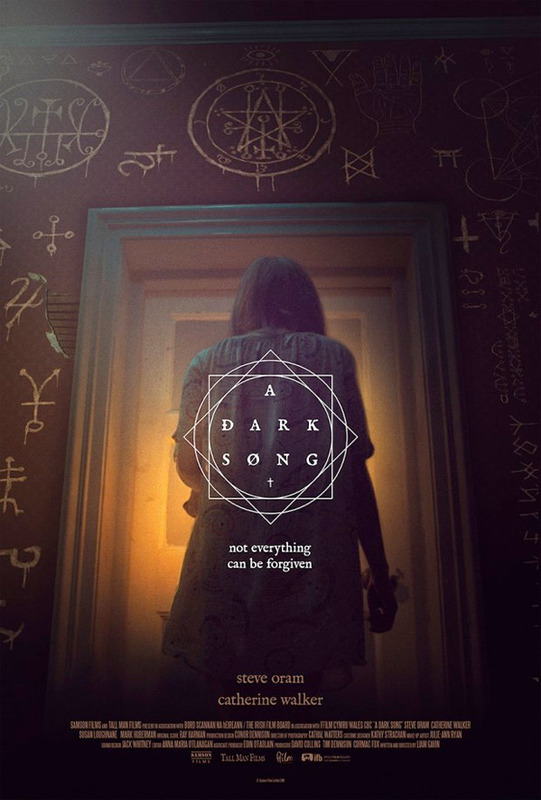 A Dark Song is both written and directed by up-and-coming Irish/Welsh filmmaker Liam Gavin, making his feature directorial debut after a number of short films previously. The film premiered at the Galway Film Fleadh in Ireland last year, and also played at Fantastic Fest, plus the Sitges and London Film Festivals. The film is still searching for a US distributor, so no release date is set yet. Stay tuned for updates. Interested? I'd maybe watch it just for that beard the guy has. Looks formulaic and kind of silly. Jump scares abound! I thought the setup was given in a rather unique way. Often, it's not often the pagan priest is that straightforward. I'd like to know what the lady is hiding from the priest and what befalls them. That being stated, I'm probably not going to see this.